Rogers Hornsby, Sr. (April 27, 1896 – January 5, 1963), nicknamed "The Rajah", was an American baseball infielder, manager, and coach who played 23 seasons in Major League Baseball (MLB). He played for the St. Louis Cardinals (1915–1926, 1933), New York Giants (1927), Boston Braves (1928), Chicago Cubs (1929–1932), and St. Louis Browns (1933–1937). Hornsby had 2,930 hits and 301 home runs in his career; his career .358 batting average is second only to Ty Cobb's average. He was named the National League (NL)'s Most Valuable Player (MVP) twice, and was a member of one World Series championship team. Born and raised in Texas, Hornsby played for several semi-professional and minor league teams. In 1915, he began his major league career with the St. Louis Cardinals and remained with the team for 12 seasons; during this period, Hornsby won his first MVP Award and the Cardinals won the 1926 World Series. After that season, he spent one season with the New York Giants and another with the Boston Braves before being traded to the Chicago Cubs. He played with the Cubs for four years and won his second MVP Award before the team released him in 1932. Hornsby re-signed with the Cardinals in 1933, but was released partway through the season and was picked up by the St. Louis Browns. He remained there until his final season in 1937. From 1925 to 1937, Hornsby was intermittently his own manager. After retiring as a player, he managed the Browns in 1952 and the Cincinnati Reds from 1952 to 1953. Hornsby is one of the best hitters of all time. His career batting average of .358 is second only to Ty Cobb, at .367, in MLB history. He also won two Triple Crowns and batted .400 or more three times during his career. He is the only player to hit 40 home runs and bat .400 in the same year (1922). His batting average for the 1924 season was .424, a mark that no player has matched since. He was elected to the National Baseball Hall of Fame in 1942 and the St. Louis Cardinals Hall of Fame in 2014. Hornsby married three times, in 1918, 1924, and 1957, and had two children, one from each of his first two marriages. Known as someone who was difficult to get along with, he was not at all well-liked by his fellow players. He never smoked, drank, or went to the movies, but frequently gambled on horse races during his career. Hornsby was born in Winters, Texas, the last of Ed and Mary (Rogers) Hornsby's six children. When Hornsby was two years old, his father died of unknown causes. Four years later, the surviving Hornsbys moved to Fort Worth, Texas, so Hornsby's brothers could get jobs in the meat packing industry to support the family. Hornsby started playing baseball at a very young age; he once said, "I can't remember anything that happened before I had a baseball in my hand." He took a job with the Swift and Company meat industry plant as a messenger boy when he was 10 years old, and he also served as a substitute infielder on its baseball team. By the age of 15, Hornsby was already playing for several semi-professional teams. He also played baseball for North Side High School until 10th grade, when he dropped out to take a full-time job at Swift and Company. While he was in high school, Hornsby also played on the football team, alongside future College Football Hall of Famer Bo McMillin. In 1914, Hornsby's older brother Everett, a minor league baseball player for many years, arranged for Rogers to get a tryout with the Texas League's Dallas Steers. He made the team, but did not play in any games for the Steers; he was released after only two weeks. Following his dismissal, he signed with the Hugo Scouts of the Class D Texas–Oklahoma League as their shortstop for $75 per month ($1,775 today). The Scouts went out of business a third of the way through the season, and Hornsby's contract was sold to the Denison Champions of the same league for $125 ($2,958 today). With both teams in 1914, Hornsby batted .232 and committed 45 errors in 113 games. The Denison team changed its name to the Denison Railroaders and joined the Western Association in 1915. They raised Hornsby's salary to $90 per month ($2,109 today). Hornsby's average improved that season to .277 in 119 games, but he made 58 errors. Nonetheless, his contributions helped the Railroaders win the Western Association pennant. At the end of the season, a writer from The Sporting News said that Hornsby was one of about a dozen Western Association players to show any major league potential. Hornsby came to the attention of the St. Louis Cardinals during an exhibition series between that team and the Railroaders in spring training in 1915. Cardinals' manager Miller Huggins told his only scout, Bob Connery, to look for minor league players to fill the roster of their financially struggling team. In September, the Cardinals purchased Hornsby's contract from Denison and added him to their major league roster, although his only professional baseball experience had been in Class D. Hornsby's first game came on September 10, when he relieved Art Butler at shortstop in a 7–1 loss to the Cincinnati Reds. Three days later he started a game, and he got his first hit the next day against Rube Marquard of the Brooklyn Robins. Hornsby finished the season with a .246 average in 57 at-bats while the Cardinals finished in sixth place in the National League (NL). At only 19 years old, Hornsby was the fourth-youngest player in the NL that year. The Cardinals picked up Roy Corhan from the San Francisco Seals of the Pacific Coast League to play at shortstop in 1916, making Hornsby one of three candidates for the position. Hornsby's great performance in spring training, a shoulder injury to Corhan, and poor hitting by Butler meant Hornsby was the starting shortstop on Opening Day. He had both runs batted in (RBIs) in the Cardinals' 2–1 victory over the Pittsburgh Pirates that day. On May 14, he hit his first major league home run against Jeff Pfeffer of Brooklyn. He rotated among infield positions before finally settling in at third base for much of the second half of the year. Late in the season, he missed 11 games with a sprained ankle. He finished 1916 with a .313 average, fourth in the NL, and he was one short of the league lead in triples with 15. Hornsby returned to the shortstop position in 1917 after Corhan returned to San Francisco and Butler was released. After playing nearly every game throughout the first month of the season, Hornsby was called away from the team on May 29 after his brother William was shot and killed in a saloon. Rogers attended the funeral on June 1 and returned to the Cardinals on June 3, finishing the season without missing any more playing time. His batting statistics improved from the previous season; his .327 batting average was second in the league, and he led the league in triples (17), total bases (253), and slugging percentage (.484). Many baseball players were drafted to fight in World War I in 1918, but Hornsby was given a draft deferment because he was supporting his family. During the offseason, Miller Huggins, unhappy with the Cardinals' management, left the team to manage the New York Yankees. He was replaced by Jack Hendricks, who had managed the Indianapolis Indians to a pennant in the American Association the previous year. Hornsby lacked confidence in Hendricks's ability to run the Cardinals, and the two men developed animosity towards each other as a result of Hornsby's growing egotism and fondness for former manager Huggins. Under Hendricks, Hornsby's batting average dipped to .281. He had problems off the field too; on June 17, Hornsby hit St. Louis resident Frank G. Rowe with his Buick when Rowe stepped out in front of traffic to cross an intersection. Rowe sued Hornsby for $15,000 ($236,383 today), but Hornsby eventually settled for a smaller, undisclosed amount, and the case was dismissed. He was still among the league leaders in triples and slugging percentage in 1918, but after the season ended with the Cardinals in last place, he announced that he would never play under Hendricks again. Partially due to Hornsby's complaints, Hendricks was fired after the season and replaced by Branch Rickey, then president of the Cardinals. In 1919, after the Cardinals acquired shortstop Doc Lavan, Rickey tried converting Hornsby into a second baseman in spring training. Hornsby played third base for most of the year. His batting average was low at the beginning of the season but improved by June. At season's end, his average of .318 was second-highest in the league, and he also finished second in total bases and runs batted in. "Hornsby is the greatest hitter I've ever had to face. I've tried to fool him every way possible, but it just cannot be done. Personally, I don't think a more skillful man ever stepped up to the plate." In 1920, Rickey moved Hornsby to second base, where he remained for the rest of his career. He started the year with a 14-game hitting streak. On June 4, he had two triples and two RBIs as the Cardinals defeated the Chicago Cubs 5–1, a game that ended future Hall of Famer Grover Cleveland Alexander's 11-game winning streak. Hornsby finished the season with the first of seven batting titles by hitting .370, and he also led the league in on-base percentage (.431), slugging percentage (.559), hits (218), total bases (329), doubles (44), and RBIs (94). The beginning of the live-ball era led to a spike in hitting productivity throughout the majors, which helped Hornsby to hit with increased power during the 1921 season. He hit .397 in 1921, and his 21 home runs were second in the league, more than twice his total in any previous season. He also led the league in on-base percentage (.458), slugging percentage (.639), runs scored (131), RBIs (126), doubles (44), and triples (18). The Cardinals held a special day in Hornsby's honor on September 30 before a home game against the Pittsburgh Pirates, and they presented Hornsby with multiple awards before the game, including a baseball autographed by President of the United States Warren G. Harding. The Cardinals beat the Pirates 12–4 that day as Hornsby hit a home run and had two doubles. By the 1922 season, Hornsby was considered a big star, having led the league in batting average, hits, doubles, and runs batted in multiple times. As a result, he sought a three-year contract for $25,000 per season. After negotiating with Cardinals management, he settled for a three-year, $18,500 contract ($261,979 today), which made him the highest-paid player in league history to that point. He then became the only player in history to hit over 40 home runs and bat over .400 in the same season. On August 5, Hornsby set a new NL record when he hit his 28th home run of the season off of Jimmy Ring of the Philadelphia Phillies. From August 13 through September 19, he had a 33-game hitting streak. He finished the year with a new record of 42 home runs, and he also set NL records in hits (250) and slugging percentage (.722, the highest ever for 600+ at-bat players). He won the first of his two Triple Crowns that year, and he led the league in batting average (.401), RBIs (152), on-base percentage (.459), doubles (46), and runs scored (141). His 450 total bases was the highest mark for any NL player ever. On defense, Hornsby led all second basemen in putouts, double plays, and fielding percentage. His batting performance that year was, and still is, one of the finest in MLB history, and his 42 home runs are still the most ever for a .400 hitter. Rogers Hornsby (pictured on a 1922 baseball card) takes a swing. On May 8, 1923, Hornsby suffered an injury to his left knee in a game against the Phillies when he turned to make a throw. He returned 10 days later, but the injury lingered, and he was removed from a game against the Pirates on May 26 to be examined by Robert Hyland, the Cardinals' physician. Hyland had Hornsby's knee placed in a cast for two weeks, after which he returned to the Cardinals. During a game in August, Hornsby was on third base late in the game and threw up his hands in disgust in response to a sign flashed by Rickey; he had given the current batter the take sign, and Hornsby felt the batter should have hit the ball. After the game, he and Rickey fought in the clubhouse, but teammates quickly broke it up. Hornsby missed several games late in the year with injuries that the Cardinals (and Hyland) did not believe to be serious; as a result he was fined $500 ($6,956 today) and suspended for the last five games of the year. However, Hornsby still won his fourth consecutive NL batting title with a batting average of .384. He also repeated as the leader in on-base percentage (.459) and slugging percentage (.627). 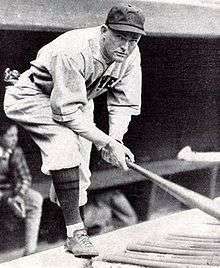 Hornsby raised his average to .424 in 1924, which is the sixth-highest batting average in a single season in MLB history, and the live-ball era batting average record. He led the league with 89 walks, producing a .507 on-base percentage. His slugging percentage of .696 again led the league, as did his 121 runs scored, 227 hits, and 43 doubles; he hit 25 home runs as well. That year, the NL reintroduced its Most Valuable Player (MVP) award. Although Hornsby was expected to win the award, it went to Dazzy Vance instead. Cincinnati voter Jack Ryder left Hornsby's name off his ballot altogether because he believed Hornsby was an MVP on the stat sheet, but was not a team player. In 1962, the Baseball Writers' Association of America presented Hornsby with an award retroactively recognizing him as the 1924 MVP. In 1925, Sam Breadon, the owner of the Cardinals, wished to replace Rickey as manager. Hornsby initially declined the job. After discovering that Rickey planned to sell his stock in the Cardinals if he was replaced as field manager, Hornsby agreed to take the job as long as Breadon would help him purchase the stock. Breadon agreed, and Hornsby became the Cardinals' manager. Hornsby finished the year with his second Triple Crown, when he combined a .403 batting average with 39 home runs and 143 RBIs. He bested teammate Jim Bottomley in the batting title race by nearly 40 points. That year, he won the MVP Award, receiving 73 out of 80 possible votes. His .756 slugging percentage set an NL record. The Cardinals finished in fourth place in 1925, finishing one game over .500, though the team won 64 games and lost 51 under Hornsby. During the year, his wife Jeanette had a son, Billy. Hornsby had an off-year offensively in 1926, as he hit only .317 with 11 home runs. Nonetheless, St. Louis won its first NL pennant. In the 1926 World Series, the Cardinals defeated the Yankees in a seven-game series; Hornsby tagged out Babe Ruth on a stolen base attempt, ending the Series and giving St. Louis its first undisputed world championship. During post-season negotiations for a new contract, Hornsby demanded $50,000 per year for three years. Breadon agreed to a one-year contract for $50,000 ($669,455 today). When Hornsby refused to give way, the Cardinals traded him to the New York Giants for Frankie Frisch and Jimmy Ring on December 20, 1926. The trade was briefly postponed as NL president John Heydler stated that Hornsby could not play for the Giants while he held stock in the Cardinals. Hornsby wanted $105 per share for his stock, a price Breadon was unwilling to pay. In early 1927, Hornsby was able to sell his shares at $105 each, enabling him to officially become a Giant. Hornsby enjoyed a better season in 1927, as he hit .361 and led the league in runs scored (133), walks (86), and on-base percentage (.448). He managed the Giants for part of the year as well, as manager John McGraw dealt with health problems. Hornsby's performance helped guide the Giants to a 92–62 win–loss record during the season, which was good enough for third place in the NL. However, Hornsby's gambling problems at the racetrack and distrust of Giants' management annoyed team owner Charles Stoneham. During the offseason he was traded to the Boston Braves for Jimmy Welsh and Shanty Hogan. With the Braves in 1928, Hornsby was again the league's most productive hitter; he won his seventh batting title with a .387 average, also leading the league in on-base percentage (.498), slugging percentage (.632), and walks (107). One month into the season, manager Jack Slattery resigned, and the Braves hired Hornsby to be his replacement. The Braves, however, lost 103 games and finished in seventh place out of eight teams in the NL. They were struggling financially as well, and when the Chicago Cubs offered $200,000 ($2,760,853 today) and five players for Hornsby, the Braves found the offer too good to pass up. Hornsby hit .380 in 1929 for Chicago while recording 39 home runs and leading the league with a .679 slugging percentage and 156 runs scored; the .380 batting average set a Cubs team record. He also collected another MVP award, and the Cubs won the NL pennant. However, they lost in the 1929 World Series to the Philadelphia Athletics in five games, as Hornsby batted .238 with one RBI. He also set a World Series record for strikeouts with eight. After the first two months of the 1930 season, Hornsby was batting .325 with two home runs. 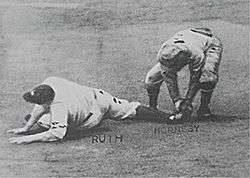 In the first game of a doubleheader against the Cardinals, Hornsby broke his ankle while advancing to third base. He did not return until August 19, and he was used mostly as a pinch-hitter for the rest of the season. When Joe McCarthy was fired with four games remaining in the season Hornsby became the team's manager. Hornsby finished the year with a .308 batting average and two home runs. On April 24, 1931, Hornsby hit three home runs and drove in eight runs in a 10–6 victory over Pittsburgh. Hornsby played in 44 of the first 48 games, but after a disappointing performance he only played himself about half the time for the rest of the year. In 100 games, he had 90 RBIs, 37 doubles, and a batting average of .331. He also led the league in on-base percentage (.421) for the ninth time in his career. The team finished 84–70, 17 games back of the pennant-winning Cardinals, and four games back of the Giants. The 1931 season was Hornsby's last as a full-time player. Boils on his feet bothered him during the start of the 1932 season, and he did not play his first game until May 29. Hornsby played right field from May 29 to June 10, appeared in two games as a pinch hitter, played third base from July 14 through July 18, and played one last game as a Cub when he pinch-hit on July 31. William Veeck, Sr., who was running the team, was unhappy with Hornsby's management of the team. Hornsby maintained strict rules, and Veeck thought his managing style hurt team morale. Veeck believed Hornsby broke a cardinal rule of baseball in one particular incident. Hornsby disagreed with a call made by the umpire. Instead of disputing the call himself, as was the manager's job, Hornsby sent another player to argue with the umpire. That player was ejected from the game. On August 2, although the Cubs were in second place, Hornsby was released, and Charlie Grimm replaced him as manager. Hornsby had played 19 games, batting .224 with one home run and seven RBIs. Although the Cubs advanced to the 1932 World Series, the players voted not to give Hornsby any of the World Series money. Hornsby did not play for the rest of 1932, but the Cardinals signed him as a player on October 24 for the 1933 season. He played regularly at second base from April 25 through May 5, but he was used mostly as a pinch hitter with the Cardinals. On July 22, he had his final NL hit in a 9–5 loss to the Braves. Through July 23, Hornsby was batting .325 with two home runs and 21 RBIs. However, the Cardinals chose to place him on waivers. Hornsby was claimed by the last-place St. Louis Browns of the American League (AL) on July 26 as player-manager. Bill Killefer had just resigned as Browns manager, and Browns owner Phil Ball wanted Hornsby as a replacement. Hornsby appeared in 11 games for the Browns. He had three hits, including a home run, in nine at-bats. The Browns finished in last place in the AL. That year, Hornsby began operating a baseball school in Hot Springs, Texas, which he ran on and off between 1933 and 1951 with various associates. Rogers Hornsby was honored alongside the retired numbers of the St. Louis Cardinals in 1937. In 1934, Hornsby started only two games, one at third base, and the other in right field. In all of his other appearances, he was a pinch hitter. For the season, he batted .304 with one home run and 11 RBIs. The Browns improved on their previous season, finishing in sixth place out of eight teams in the AL. Hornsby played in 10 games in the 1935 season, starting in 4. From April 16 through April 21, he started at first base, and he started at third base on May 22. He finished the year with five hits and a .208 average, while the Browns slipped to seventh place. Hornsby only appeared in two games with the team during the 1936 season. On May 31, his pinch-hit single in the ninth inning gave the Browns an 11–10 win over the Detroit Tigers. In his other appearance on June 9, he played first base in a 5–3 win over the Yankees. The Browns again finished in seventh place. In 1937, Hornsby played in 20 games. On April 21, in his first game of the year, Hornsby hit the final home run of his career in a 15–10 victory over the Chicago White Sox. On July 5, he had the final hit of his career in a 15–4 loss in the second game of a doubleheader with the Cleveland Indians. On July 20, Hornsby appeared in what would be his final game, a 5–4 loss to the Yankees. A day later, Hornsby was fired as manager and released as a player by the Browns, who were in last place at the time of his release. His release was partly due to an incident with Browns owner Donald Barnes. On July 15, Hornsby won $35,000 ($577,095 today) from betting on a horse race. When he tried to use $4,000 of this money to pay off a debt to Barnes, Barnes refused it, since it had come from a bookmaker. Hornsby protested to Barnes, "The money is as good as the money you take from people in the loan-shark business. It's better than taking interest from widows and orphans... "; that made his release five days later an easy decision for Barnes. Hornsby finished the 1937 season with a .321 batting average and 18 hits in 20 games, and was the oldest player in the AL that season. Before opening his own baseball school, Hornsby was an instructor at the "Roy Doan Baseball School", which operated from 1934-38 at Ban Johnson Park, Fogel Field and Majestic Park in Hot Springs, Arkansas, the site of many early Spring training facilities. Then, in 1939, Hornsby, started the "Rogers Hornsby Baseball College" in Hot Springs after Doan moved his School elsewhere. Hornsby ran the six-week event annually until 1952, usually attracting 100-200 prospects. Cy Young, Jimmie Foxx, Tris Speaker and Schoolboy Rowe were among the instructors for Hornsby's School. Held in conjunction with the baseball schools was "The George Barr Umpire School", the first umpire instructional school, with students under the direction of Barr, a Major League Umpire. Following his release from the Browns, Hornsby was unable to retire because he had lost so much money gambling over the years. He signed as a player-coach with the Baltimore Orioles of the International League in 1938 before leaving them to play for and manage the Chattanooga Lookouts of the Southern Association for the rest of the season. Hornsby then returned to the Orioles to manage them for 1939, but he did not return to the club following the season. Halfway through 1940, he signed to manage the Oklahoma City Indians of the Texas League. He led them from last place to the Texas League playoffs, where they fell to the Houston Buffaloes in four games. Hornsby began 1941 managing the Indians once again, but he resigned in the middle of the season. In November, he became the general and field manager of the Fort Worth Cats, also of the Texas league. Fort Worth finished in third place and made the playoffs in 1942, but they were eliminated in the first round by the Shreveport Sports. Hornsby went unsigned by any team in 1943, but he signed as a player-manager with the Vera Cruz Blues of La Liga Mexicana in Mexico in 1944. After hitting a game-winning grand slam for the second win of a series in March, he resigned when the team owner complained that the win would diminish the crowd for the third game of the series. Following his release, he did some commentary for radio station WTMV, assisted the Cleveland Indians in spring training in 1947, and became a TV announcer for Chicago Cubs games in 1949. Hornsby did not become a manager or coach again until 1950, when he was hired to manage the Texas League's Beaumont Roughnecks. Beaumont won the pennant, but they were swept in the first round of the playoffs by the San Antonio Missions. The next year, in 1951, Hornsby managed the Seattle Rainiers of the Pacific Coast League. Under Hornsby's leadership, the Rainiers won the pennant. In 1952, Hornsby was again hired to manage the St. Louis Browns, his first major league job in 16 years. The Browns' owner, Bill Veeck, was the son of former Cubs president and general manager William Veeck, Sr. Hornsby was not well received by the players, however. On June 9, he was fired due to a disagreement with Veeck over an incident against the Yankees the day before. During the game, a fan prevented Gil McDougald of the Yankees from catching a fly ball, and the umpire ruled that it was fan interference. Hornsby did not initially argue the call, and a few minutes later Veeck forced him to do it (when it was already too late to do anything about it). This led to Hornsby and the Browns parting ways. The Browns players were so happy about Hornsby's firing that they gave Veeck an engraved trophy to thank him. A little over a month later, on July 26, Hornsby was hired to replace Luke Sewell as manager of the Cincinnati Reds. After Hornsby completed two mediocre seasons with the club, the Reds announced that he would not return for 1954. He finished his MLB managerial career with a record of 701–812. Following his dismissal, Hornsby worked as a coach for the Chicago Cubs from 1958 to 1960 before becoming a scout and third base coach for the New York Mets in 1962. In 1963, Hornsby died of a heart attack. He was buried in Hornsby Bend Cemetery near Austin, Texas. 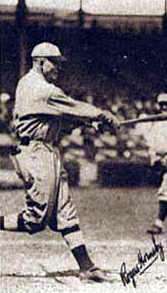 Baseball experts and sportswriters consider Hornsby to be one of the greatest hitters of all time. His lifetime batting average of .358 is only exceeded by Ty Cobb's career mark of .367. He won seven batting titles in total, a feat tied or exceeded by only five players (Cobb (11 or 12, depending on the source), Tony Gwynn (8), Honus Wagner (8), Rod Carew (7), and Stan Musial (7)). Hornsby led the National League in slugging percentage nine times, a record that still stands. He also hit more home runs, drove in more runs, and had a higher batting average than any other National League player during the 1920s, which makes him one of four players in baseball history (along with Honus Wagner, Ted Williams, and Albert Pujols) to win a decade "triple crown". He hit a career total of 301 home runs and was the first National League player to hit 300. His 264 home runs as a second baseman was a major league record for that position until Joe Morgan surpassed him in 1984. Hornsby was also a very consistent hitter whether he was playing at home or on the road. His lifetime home batting average was .359, and his lifetime away batting average was .358. Ted Williams, who had the highest career batting average since Hornsby, said that Hornsby was the greatest hitter for power and average in baseball, and Frankie Frisch said of him, "He's the only guy I know who could hit .350 in the dark." Hornsby also holds second place on the unofficial major league record list of "consecutive games with two or more hits" with 13 games, first place honors going to Count Campau's 15-game streak. Hornsby is only the second right-handed batter in history to hit over .400 three times and is considered, according to the Los Angeles Times, to be the greatest right-handed hitter in history. He led the National League in batting average, on-base percentage, slugging percentage, and total bases every year from 1920 to 1925. He is one of only two players (the other being Ted Williams) to win the batting Triple Crown more than once, but only Hornsby batted .400 on both occasions. Rogers Hornsby was so respected as a hitter that once, when a rookie pitcher complained to umpire Bill Klem that he thought he had thrown Rogers a strike, Klem replied, "Son, when you pitch a strike, Mr. Hornsby will let you know." Hornsby was also renowned for his speed, and was considered to be the fastest player in the National League in his prime. He did not try to steal very often but used his speed to take extra bases. Between 1916 and 1927 Hornsby had 30 inside-the-park home runs, and he led the league with 17 triples in 1917 and 18 triples in 1921; he had 20 triples in 1920. However, Hornsby was often hard to get along with, a major reason he changed teams so frequently in the last decade of his career. He usually left due to falling out with the front office. Most of the players he managed did not like him due to his insistence that others follow his lifestyle, although some (like Woody English and Clint Courtney) did. Hornsby never played cards, but he did bet frequently on horse races, and he lost more than he won. His gambling was often a factor in his dismissal from a team. By most contemporary accounts, he was at least as mean and nasty as Cobb, who was known in his time for his aggressive attitude and dirty play. He never went to movies or read books, convinced that it would harm a batter's eyesight, and he never smoked or drank. Hornsby was elected into the National Baseball Hall of Fame in 1942. In 1999, Hornsby was ranked ninth on The Sporting News list of Baseball's Greatest Players. Later that year, he was named to the Major League Baseball All-Century Team. In 2001, writer Bill James ranked him as the 22nd-greatest player and the third-greatest second baseman in baseball history, while at the same time documenting his unpopularity and his difficult personality. He is also tied for eighth overall with Stan Musial in wins above replacement for position players. Hornsby has also been recognized on the St. Louis Walk of Fame In January, 2014, the Cardinals announced Hornsby among 22 former players and personnel to be inducted into the St. Louis Cardinals Hall of Fame Museum for the inaugural class of 2014. On September 23, 1918, Hornsby married Sarah Elizabeth Martin, whom he had known since he played for the Denison Railroaders, in Philadelphia. They had a son, Rogers Hornsby, Jr., on November 15, 1920. Rogers Jr. died in a plane crash on December 23, 1949 near Savannah, Georgia. During 1922 he began seeing Jeanette Pennington Hine, who was married to an automobile-supply salesman named John Hine. On June 12, 1923, Hornsby divorced Sarah, and Hine divorced her spouse in 1923 as well; the two were married on February 28, 1924. As a result of the divorce, Sarah took custody of Rogers Jr.
Hornsby and Jeanette had a son, Billy, on June 2, 1925. Billy played baseball for several years in the minor leagues, but never reached the majors. Hornsby and Jeanette became estranged in December 1944, and Hornsby began seeing a woman named Bernadette Harris, whom he called his "personal good friend and secretary", in 1945. They lived together after 1948, until Harris committed suicide by jumping out of a third-story window on September 7, 1953. The suicide was attributed to depression. Following Jeanette's death on June 1, 1956, Hornsby married Marjorie Bernice Frederick Porter on January 27, 1957. They remained together until Hornsby's death in 1963. ↑ "Edward Hornsby Minor League Statistics & History". Baseball-Reference.com. Retrieved July 4, 2011. ↑ "Rogers Hornsby Minor League Statistics & History". Baseball-Reference. Retrieved July 1, 2011. 1 2 3 4 5 6 7 8 9 10 11 12 13 14 15 16 17 18 19 "Rogers Hornsby Statistics and History". Baseball-Reference. Retrieved January 25, 2011. ↑ "St. Louis Cardinals 5, Chicago Cubs 1". Retrosheet. Retrieved February 18, 2011. ↑ "Souvenir For Hornsby; Baseball Autographed by President Harding for St. Louis Star.". The New York Times. September 17, 1921. Retrieved July 4, 2011. ↑ Lemire, Joe (September 8, 2010). "Ranking the Triple Crown seasons in modern baseball history". Sports Illustrated. Retrieved January 25, 2011. ↑ "Philadelphia Phillies 9, St. Louis Cardinals 1". Retrosheet. Retrieved February 23, 2011. ↑ "The 1922 STL N Regular Season Batting Log for Rogers Hornsby". Retrosheet. Retrieved February 23, 2011. ↑ Nemec and Wisnia, p. 110. ↑ "1925 St. Louis Cardinals Batting, Pitching, & Fielding Statistics". Baseball-Reference. Retrieved January 25, 2011. 1 2 3 "Rogers Hornsby Managerial Record". Baseball-Reference. Retrieved March 9, 2011. ↑ "The 1929 CHI N World Series Batting Log for Rogers Hornsby". Retrosheet. Retrieved January 22, 2011. ↑ "Chicago Cubs 10, Pittsburgh Pirates 6". Retrosheet. Retrieved January 22, 2011. ↑ "1931 National League Season Summary". Baseball-Reference.com. Retrieved August 25, 2011. 1 2 "The 1932 CHI N Regular Season Batting Log for Rogers Hornsby". Retrosheet. Retrieved January 22, 2011. 1 2 Purdy, Dennis (2006). The Team-by-Team Encyclopedia of Major League Baseball. New York City: Workman Publishing Company. p. 936. ISBN 0-7611-3943-5. ↑ "Boston Braves 9, St. Louis Cardinals 5". Retrosheet. Retrieved January 22, 2011. ↑ "The 1934 STL A Regular Season Batting Log for Rogers Hornsby". Retrosheet. Retrieved January 22, 2011. ↑ "The 1935 STL A Regular Season Batting Log for Rogers Hornsby". Retrosheet. Retrieved January 22, 2011. ↑ "St. Louis Browns 11, Detroit Tigers 10". Retrosheet. Retrieved January 22, 2011. ↑ "St. Louis Browns 5, New York Yankees 3". Retrosheet. Retrieved January 22, 2011. ↑ "Cleveland Indians 15, St. Louis Browns 4 (2)". Retrosheet. Retrieved January 22, 2011. ↑ Kurkjian, Tim (December 18, 2009). "Selecting the All-Decade team". ESPN. Retrieved December 28, 2010. 1 2 "Hornsby, Rogers". Baseball Hall of Fame. Retrieved December 28, 2010. ↑ Rothman, Stanley; Le, Quoc (April 2010). "Streaking:Finding the Probability for a Batting Streak" (PDF). Math Awareness Month/Mathematics and Sports (www.mathaware.org). American Mathematical Society. p. 13. Retrieved January 3, 2011. ↑ Spatz, Lyle, ed. (February 2010). "Most Consecutive Multi-Hit Games" (PDF). Society for American Baseball Research (Baseball Records Committee). p. 1. Retrieved January 3, 2011. 1 2 "Hornsby, 66, Dies of Heart Attack". Los Angeles Times. January 6, 1963. p. C1. ↑ "Rogers Hornsby Quotes". Baseball Almanac. Retrieved 2012-04-28. ↑ Nash, Ogden (January 1949). "Line-Up for Yesterday". SPORT. ↑ "Page 2 mailbag – Readers: Dirtiest pro players". ESPN.com. 2007. Retrieved September 12, 2011. ↑ "Baseball's 100 Greatest Players". The Sporting News. April 1999. p. 20. ↑ "All-Century Team final voting". ESPN. Associated Press. Retrieved December 28, 2010. ↑ James, pp. 361, 485. ↑ Plane Crash Claims Eleven: Rogers Hornsby Jr. One of Men Killed.Spartenburg Herald-Journal, December 24, 1949, page 1. ↑ "Bill Hornsby Minor League Statistics & History". Baseball-Reference. Retrieved January 25, 2011. Alexander, Charles C. (1995). Rogers Hornsby: A Biography. New York City: Henry Holt and Company. ISBN 0-8050-2002-0. D'Amore, Jonathan (2004). Rogers Hornsby: a biography. Westport, Connecticut: Greenwood Publishing Group. ISBN 978-0-313-32870-1. James, Bill (2001). The New Bill James Historical Baseball Abstract. New York City: Free Press. ISBN 0-684-80697-5. Kavanagh, Jack (1991). Rogers Hornsby (Baseball Legends). New York City: Chelsea House Publications. ISBN 978-0-7910-1178-2. Lowenfish, Lee (2009). Branch Rickey: Baseball's Ferocious Gentleman. Lincoln, Nebraska: University of Nebraska Press. ISBN 978-0-8032-2453-7. Nemec, David; Wisnia, Saul (2000). 100 Years of Major League Baseball: American and National Leagues, 1901–2000. Lincolnwood, Illinois: Publications International, Ltd. ISBN 978-0-7853-4395-0. Veeck, Bill (2001). Veeck as in Wreck: the autobiography of Bill Veeck. Chicago: University of Chicago Press. ISBN 978-0-226-85218-8. Williams, Ted; Underwood, John (1969). My Turn at Bat: The Story of My Life. New York City: Simon & Schuster. ISBN 0-671-63423-2. 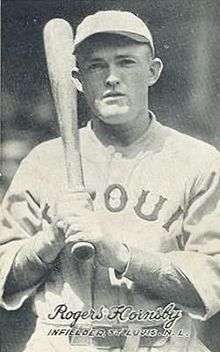 Wikimedia Commons has media related to Rogers Hornsby.